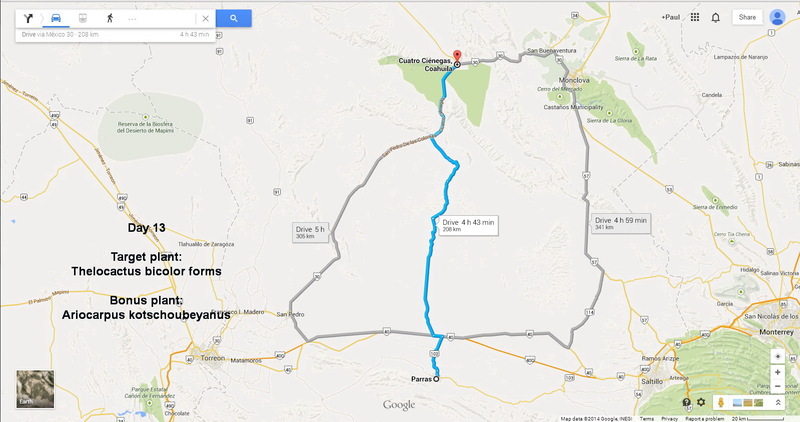 If you look at a road map of Coahuila, you’ll see that there are three ways of getting from Parras to Cuatro Cienegas: One is by taking Mex 40 west, to Torreon, followed by the Mex 30 north, towards Monclova, while the obvious alternative is taking Mex 40 east towards Saltillo and then head north on Mex 57. But there is a third option, to head straight north, thus saving some 150 km – DON’T! Although road maps will show the road as a reasonable gravel road near where it meets the highways, there is a ‘white’ line that suggests the lowest quality of road on the map. SatNav knew about it, or rather, knew about stretches of it. Yesterday we would drive on nice new asphalt when SatNav was completely unaware of its existence and we hoped that this would be the case again today – it wasn’t. At times this stretch, to cross the hills, just disappeared while at other times what was a line on SatNav was a warren of tracks created by local miners. When we came to a sign post pointing to Australia it seemed that we were really lost, but fortunately there is a settlement by that name here as well. As usual, all’s well that ends well, so after an interesting journey – compliments again to our driver Cliff – we arrived safely at Hotel Quinta Santa Cecilia, just two blocks from the Plaza. Although we may venture a little farther north on a day trip, this is our turn around point before we head back to Mexico City. We’re also half way through our time budget. Plant-wise, today’s trip added little to the range of cacti we had seen, with the exception of a few Ariocarpus kotschoubeyanus hiding in the dried up mud of what SatNav thought was a laguna. 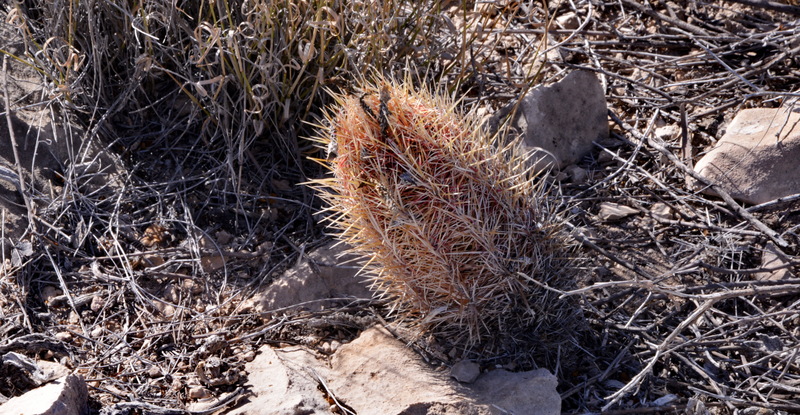 The local Thelocactus bicolor were duly photographed for comparison with those at other stops. S3083: Agave lechuguilla – by the way, ‘lechuguilla’ means ‘little lettuce’, Echinocactus horizonthalonius, Echinocereus enneacanthus, Ferocactus hamatacanthus, Fouqueria splendens, Grusonia bradtiana, Opuntia rufida, O. 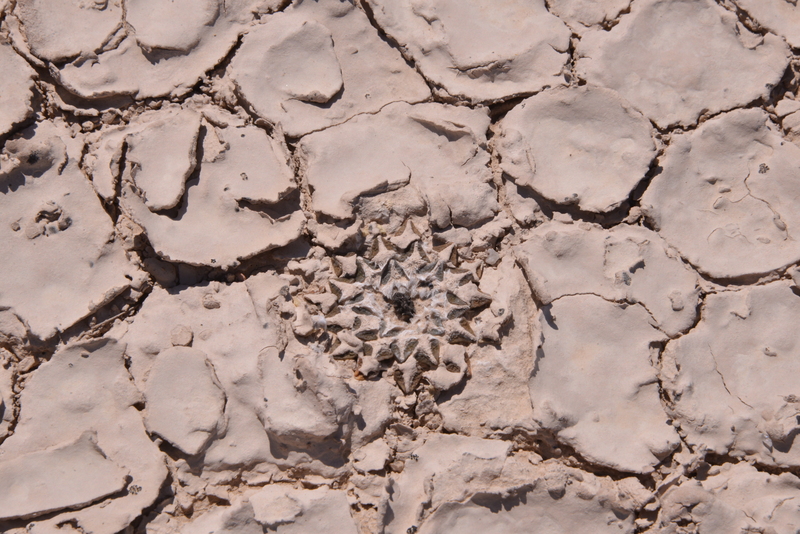 sp., Thelocactus bicolor, Yucca sp. S3085: Farther along the same track: Ariocarpus kotschoubeyanus and Echinocereus sp. S3087: assuming that the caption on the ‘Earth Gallery’ on Google Earth is correct we were near Santa Teresa de Sofia in la Sierra de Australia. Australia?! Had we taken a wrong turn? 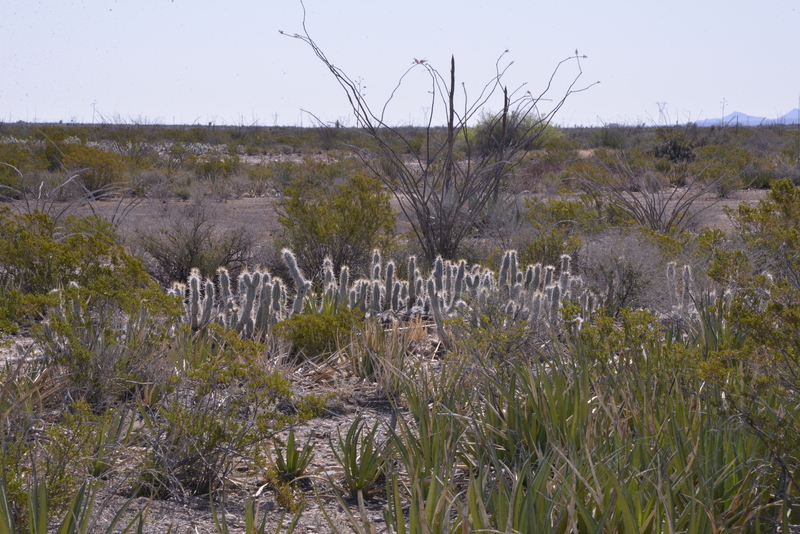 The plant list had not changed much all day: Agave sp., Euphorbia antisyphalitica, Fouquieria splendens, Grusonia bradtiana, Mammillaria pottsii, Thelocactus bicolor – the form T. wagnerianus is reported from near this location – and Yucca sp. Great point: because this plant has some differences from the typical bicolor means it’s useful that it has a name. But it need not mean that it is a different taxon! The decision of where the line is drawn between ‘variability within a species’ and ‘different enough to warrant a different botanic taxon’ is an individual and ‘fashion’ influenced one. It also leads to a great deal of confusion and ultimately no longer helps us to communicate about our plants effectively, which after all was the original purpose of nomenclature. I think it important to use names in presentations and articles that reflect current usage, but it seems that some members in the audience still use Backeberg names. As we hit Mex 30 there was a thick haze hiding the mountains. Near the hotel, the palm trees were swaying in a strong wind and clouds were looming. As I write this, the following morning, we’re back to brilliant sunshine and just a light breeze. When we arrived at the hotel, by the time that Ian had checked out rooms, the off side rear tyre was flat again. It, and the other three had taken another fair battering today! So first task tomorrow – find a vulca!